a few friends decided to have 4pax lunch at whampoa hawker centre on 25.2.2105.
anyhow on this day, it was chinese new year day 6 (初六)， and both stalls were closed. 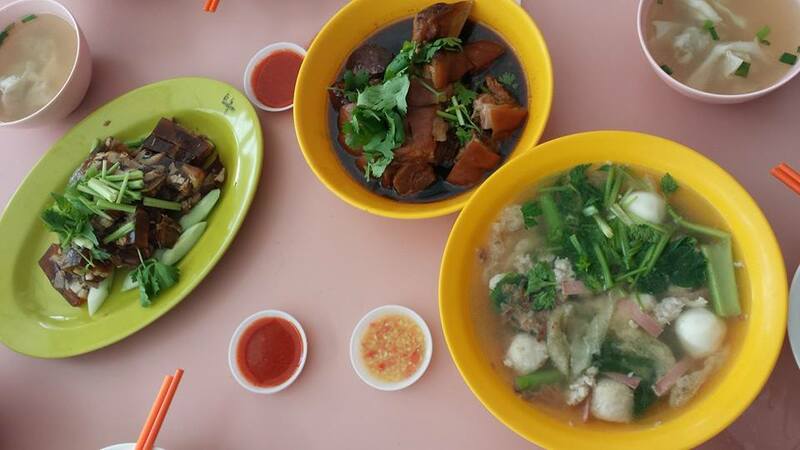 most other stalls were also closed – the hoover fish porridge, the braised duck & the hoover rojak were all closed. 1 of the stalls i like, 幸福潮州小食 a teochew food stall, was open. i ordered the fish maw soup, braised pig trotters & also the “ter kar tan” 猪脚冻 or pig trotter jelly. the stall also sells sharks meat & shark meat jelly 鲨鱼冻. i did not order them. 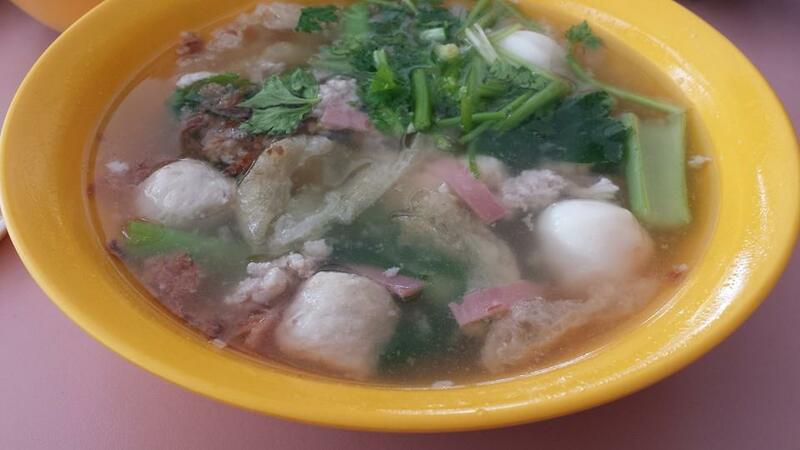 the S$4 fish maw soup was good as always, quite a lot of ingredients, and the taste of the soup was good. the “ter kar tan” 猪脚冻 or pig trotter jelly was i guess good as another at the restaurants & it was just S$5.50 for a good portion. the 鲁猪脚 braised pig trotters were exactly the flavour, texture & colour i liked. 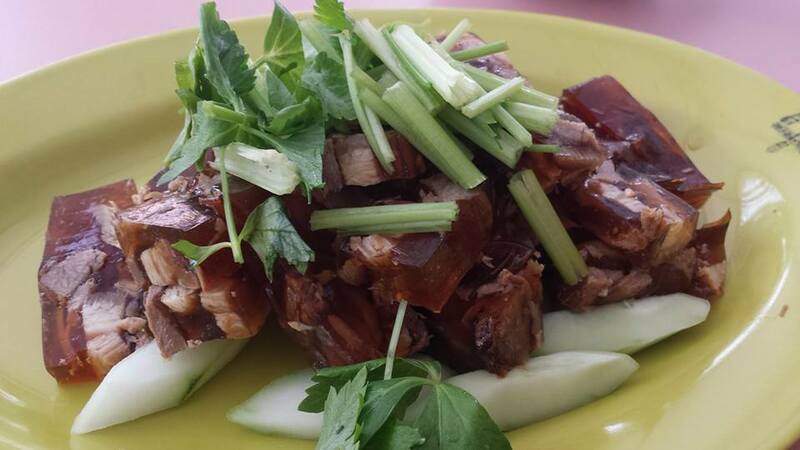 to me it was so much better than han jia bakuteh & pork leg, east coast lagoon food village. the colours looked attractive & it was properly cut & neat, not dark & overcooked & uncut block like han jia’s. the texture & bite was just right, gelatinous & with bite, not falling apart, and the taste was light & flavourful. 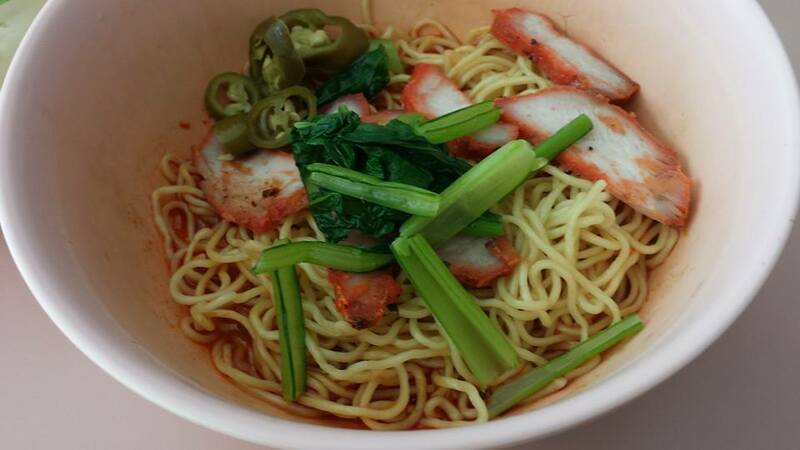 one friend bought 4 wanton noodles (S$3 per bowl). it was good. noodles were just right QQ, and i liked the spiciness. it was no better though than any of the other places i had, wanton mee @ KPT coffeeshop (this a different black version), cho kee noodles wanton mee at old airport road food centre (i think this was better), or the wanton mee at first centre serangoon avenue 4.
i would put kok kee (was at lavendar food centre but not sure where (or if) it is relocated) as the best for me, and red ring as second. 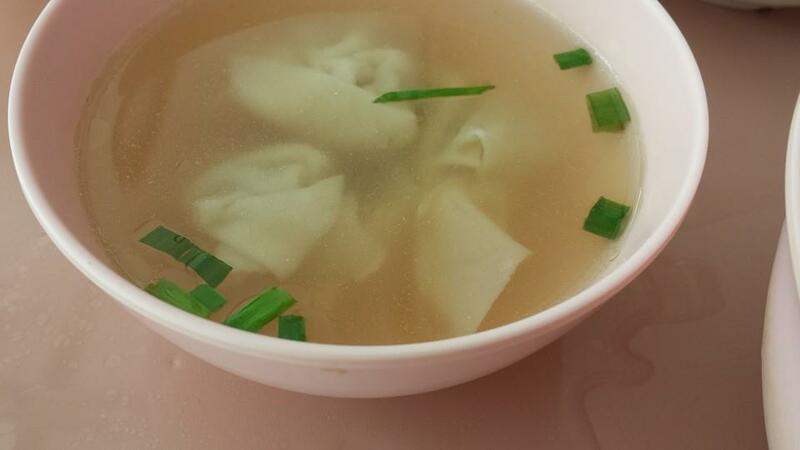 the lunch including a bowl of wanton noodles each was S$7pax. 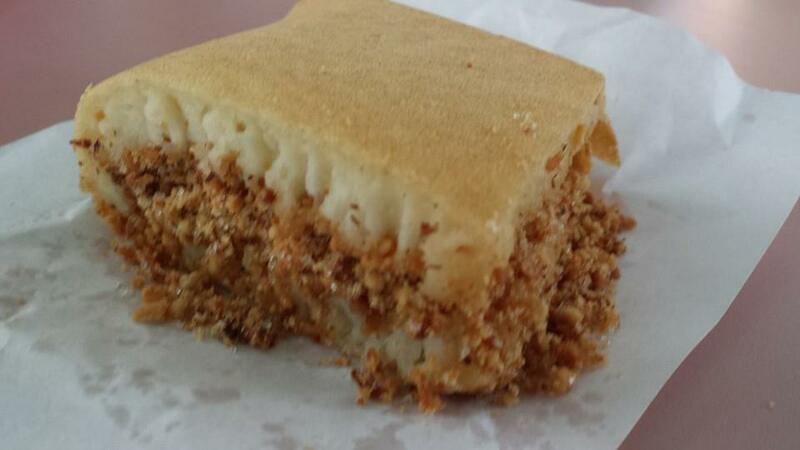 we walked over to blk 92 & had the mee chiang kueh (peanut pancake). we all preferred the peanut fillings. it was overflowing. very fun! food was good, company better. after lunch 3 of us went to visit a friend who was admitted to ttsh. This entry was posted in Buon Appetito! 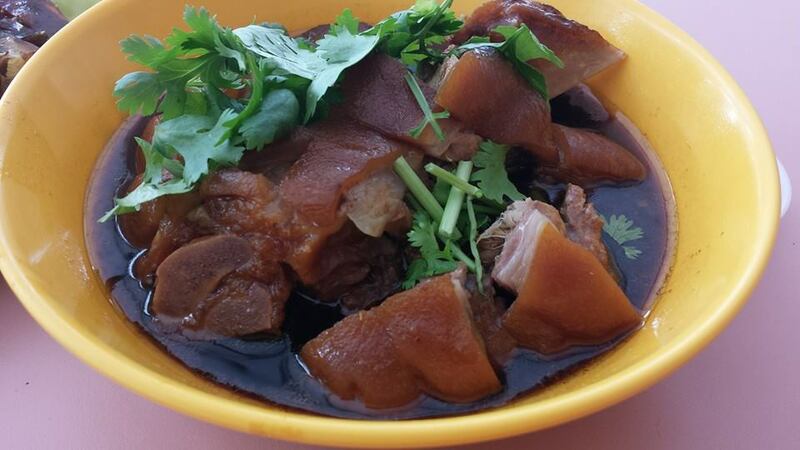 and tagged braised pig trotters, cho kee noodles wanton mee, 猪脚冻, east coast lagoon food village, 鲁猪脚, 鲨鱼冻, first centre serangoon avenue 4, fish maw soup, han jia, hoover fish porridge, hoover rojak, Kok Kee, KPT coffeeshop, lavendar food centre, old airport road food centre, pig trotter jelly, red ring, shark meat jelly, ter kar tan, wanton mee, whampoa hawker centre, 幸福潮州小食. Bookmark the permalink.